Hi everyone, hope your week is off to a good start! Just popping in with quick outfit that I wore over the weekend. 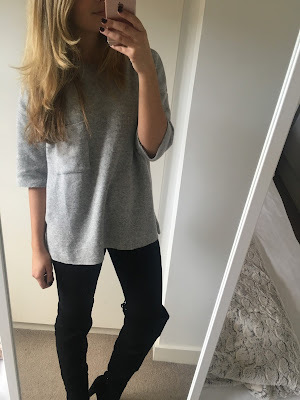 My grey Zara jumper seemed to be very popular on Instagram, so I thought I’d share a little more detail on it here! I spotted it in store a couple of weeks ago and snapped it up straight away. My obsession with all things grey is still going strong and I love the slightly oversized look. It is incredibly soft too, especially for the price – it was only €15.95! For those asking about size, I went with a small and love the fit. I wore it with black jeans during the day on Saturday and then switched it up with blue jeans and a leather jacket that evening. The boots were a great investment from Kurt Geiger last year – I got so much wear out of them. They are still available here and I could very well be tempted by the grey this season!